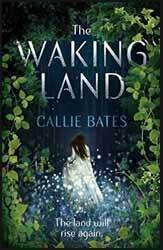 The Waking Land (2017. 384 pages) is a new fantasy novel by Callie Bates. Heavily hinted at the beginning of the story, Elanna has a hidden gift, one which she has had since birth. She is able to manipulate the natural world, growing seeds into plants in a matter of minutes. This is a talent that she has learned to hide as magic is a proscribed activity and anyone caught is handed over to the witch hunters to be driven out and killed. A bit like a football match this is a story of two halves. When we first encounter the adult Elanna she is living in the palace and considers the king as the nearest thing to a parent she has, although his real daughter, Loyce, treats her with nothing but disdain, considering her as the prodigy of dirt filth goat herders. Elanna is drawn to all things growing and only wants to move away from the court to study botany in Ida. When the King; her only protector suddenly dies, Elanna finds that she has few friends at court and a host of enemies ready to point the finger. The Elanna we first meet is a wholly unsympathetic character. I get that she may have been suffering from a degree of Stockholm syndrome, but her actions are not that of an educated young woman and I can’t help feel that if she had remembered less of her childhood - and been four years younger than the voice that Bates has ascribed to her - it would have been more in keeping. For the first half of the book the general feeling was that should she be caught and executed it would leave less of a novel for me to plough through. Of course, like most fantasy novels, Elanna holds a secret which given the right push will become full grown, allowing her to engage in a conflict through which she will attain power/status. These novels always remind me of why George R. R. Martin is such a good writer. Most fantasy novel's follow the same old plot, it’s not that Martin does not use the old ‘child with a destiny’ it’s that he subverts the old tired tropes by unceremoniously killing of character’s. Not so The Walking Land, which follows a literary path so trod by others that the indentations have become a rut. The novel picks up well in the second half when Elanna accepts that everything she knows was a lie and that the good old king was really her jailor. The transition is a bit abrupt and didn’t feel organic, but at least it left the whiny Elanna behind. The only real issue I had with the second half was that most readers when reading the descriptions will not miss the similarities to the army of the dead and their attack during the siege of Minas Tirith, with a few Entish troops. So, not a bad read, but it would have been more believable had Elanna been younger and her transition handled better.